Sweetly B Squared: Monster Jam! 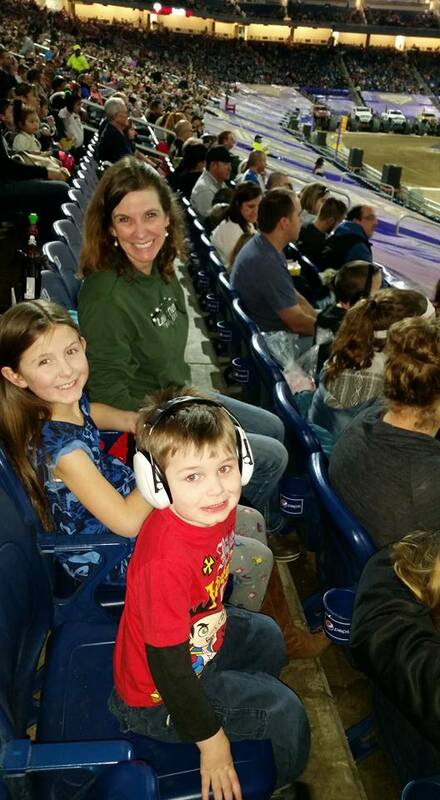 Monster Jam was a fabulous show once again. It's continually one of my favorite family shows. I think this was the first time that Jack even stayed awake for the whole show! We all had ear protection (a must!) and the only thing too loud for the little guy was the fireworks during the national anthem at the beginning. We did not attend the pit party before the event this time. We've been before, and it's a great chance to get up close with your favorite trucks and drivers. Pay attention to your local media venues leading up to events - free pit passes were available through Metro PCS. The first event was the regular races. 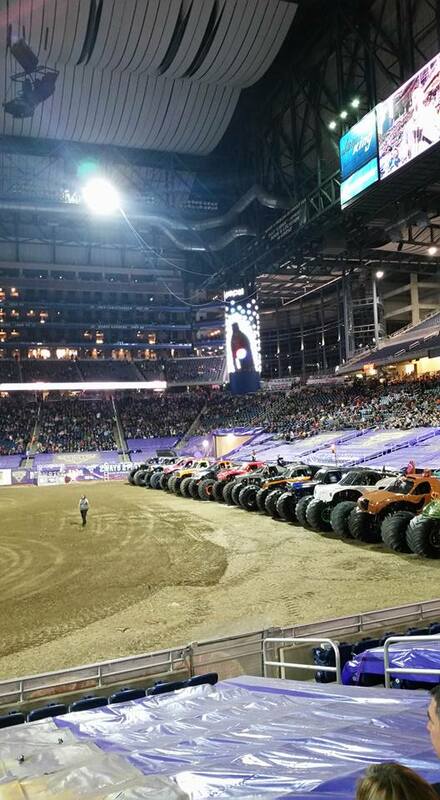 The elimination series pitted the trucks against each other just one at a time, and it was no surprise to anyone after all the brackets were done that Grave Digger won. Next up was an event that was new to us - a donut competition. While my daughter and I were hoping there would be real donuts involved, of course it was trucks..and dirt. We were plenty close to the dirt, as you can see from this picture taken from our seats. Luckily the donut competition was at the other end of the arena. Hubby and I are comparing notes, and we're pretty sure Black Ops won the donut competition. If we're wrong, please let us know. After the donut competition, we were ready for freestyle. But it was not to be, yet. They had another new event - a pairs thing where two of the Monster Truck teams actually drove dune buggy looking things. I didn't really get what was going on there. Thankfully it was just a couple rounds before we moved on to everyone's favorite - freestyle! Hubby and I discussed the fact that maybe the drivers have to have permission before they can do the really fancy backward flip. The first few drivers did well enough, but never even approached the giant wall of dirt that only a couple trucks used to attempt the flip. My favorite at this event was the incredible performance from Bounty Hunter (driven by Jim Creten). It looked like his score of 30 was going to hold til the end, but of course they saved Grave Digger and Son Uva Digger til last. Grave Digger was not meant to win this event, but Son Uva Digger put on a spectacular performance to pull ahead. I'm not sure how much luck is involved, but Son Uva Digger flipped completely from one side - like lying on its side with the wheels and body of the truck flat on the ground - to the entire other side! It was definitely impressive, and earned him the trophy for this event. 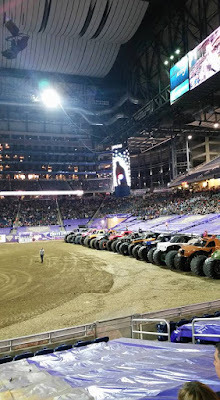 If you're local to the Detroit area, it looks like you have one more chance this year to attend Monster Jam at Ford Field on February 27. Don't miss it!